Cabinets across the country are receiving a long-overdue makeover. Minimalist styles are as popular as ever, with homeowners implementing such designs as floating cabinets and hardware free units with sliding doors. Materials have also received an update, and aluminum, semi-translucent glass, high-gloss lacquer, and even eco-friendly bamboo are all finding their way into today’s modern cabinetry. Countertops are an essential element of any kitchen, whether the homeowner is thinking in terms of design or functionality, so today’s countertops are both attractive and durable. High-end materials like beautiful granite have maintained their classic popularity in modern designs, but new materials have also made their way to the forefront. Concrete and metal, which were once banished to the outdoors, are slowly making their way back into the home, and homeowners are choosing these durable options for modern custom countertops. Most homeowners are, however, choosing to soften these materials up a bit by, for example, embedding bits of glass in the concrete or stenciling it. 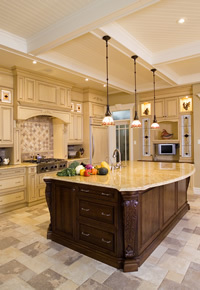 Other popular options for custom modern countertops include imbedding functional and attractive tools into the countertops themselves (such as a built-in butcher’s block), building countertops out of wood, or resorting to engineered stone materials, such as durable engineered quartz. While certain materials, such as hardwoods, will probably remain popular in flooring applications for many years to come, new materials are also coming into play in today’s modern kitchen designs. Concrete, for example, which is often painted, has become a surprisingly sought-after kitchen flooring material, as has stone, including slate. Vinyl flooring in uncommon patterns, as well as changeable flooring, such as moveable wooden blocks and floor stickers, have also become popular in modern kitchens. Kitchen appliances have received a significant update. From high-tech wine coolers to digital refrigerators that remind you when you’ve run out of milk, today’s appliances are adept at performing tasks most people never imagined. Specialty appliances, such as coffee bars and highly functional dishwashers, including ones that double as dish storage units (meaning you’ll never have to empty the dishwasher again) have also become popular. One common element among today’s high-end appliances is that most of them are built right into the cabinetry, shelving, or walls, so it will probably be essential that you do a bit of rearranging to make your modern appliances fit into your contemporary design. Today’s contemporary kitchens include a number of design elements that most people would never have expected, but if done properly, these elements can work quite well together. Whether you choose to invest in new countertops, kitchen appliances, flooring, or cabinetry, know that your investment will certainly be a worthwhile one. To make the most of your kitchen remodeling construction project, contact the construction professionals at Hartman Construction. Note: This article was written for D. R. Hartman Construction Inc., a residential & commercial construction contractor serving the Bethesda, Gaithersburg and Silver Spring, MD regions.